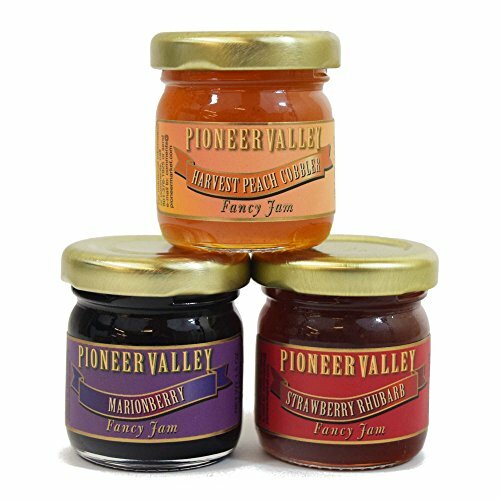 This gourmet mini jam sampler set by Pioneer Valley includes 3 delicious flavors: Harvest Peach Cobbler, Marionberry, and Strawberry Rhubarb. Our premium jam is made using the finest all natural ingredients with no artificial additives or preservatives. Packaged in a clear gift box, this pack of 3 mini 1.5 oz single serve jars makes a convenient gift for that special someone. Proudly made by hand in the great state of Utah, USA. View More In Jam, Jelly & Sweet Spread Gifts. If you have any questions about this product by Pioneer Valley, contact us by completing and submitting the form below. If you are looking for a specif part number, please include it with your message.